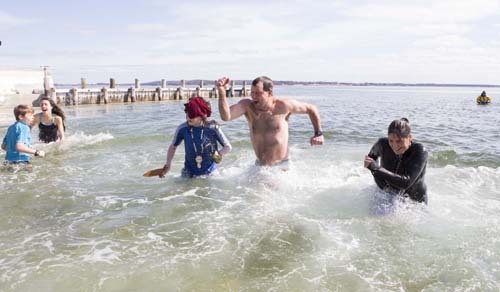 With temperatures hovering around freezing and chunks of ice floating in the bay, over a dozen people plunged into the water at Founders Landing in Southold Saturday morning to raise money for Maureen’s Haven. The annual event helps the Riverhead-based homeless outreach program, and is supported by businesses and individuals from across Long Island. Southold area first responders were stationed in the water to help out anyone in trouble, but none of the plungers suffered any ill effects from the icy waters. CYNDI MURRAY FILE PHOTO | A portion of the Suffolk County Community Block Grant funding was allocated to transforming this blighted Orient property into a Habitat for Humanity home. Southold Town is divvying up approximately $98,000 in Suffolk County grant funding to support local housing and community development projects. During the Southold Town board’s work session Tuesday, town special projects coordinator Phillip Beltz provided members with a breakdown of how the Community Development Block Grant money would be spent in 2014. Recipients include several local organizations such as Community Action Southold Town, Maureen’s Haven and the North Fork Housing Alliance. There will also be money allocated for capital improvements at the town’s community centers, Mr. Beltz said. Mr. Beltz said he would submit the Town’s recommendations on how to allocate the grant money to the county for final approval. The Town is proposing allocating roughly $23,500 of the grant money toward creating easier access between the town recreation center and community center on Peconic Lane in Peconic. The two neighboring buildings are often the site of community forums and activities, however insufficient parking at the community center and no sidewalks connecting the two neighboring buildings is an inconvenience for the public, Mr. Beltz said. There is also money set aside to paint the exterior of the community center in the proposal, Mr. Beltz said. The Town has earmarked more than $50,000 toward meeting housing needs, said Mr. Beltz, who welcomes the prospect of bringing more affordable housing to Southold. Long time CDBG recipients, the North Fork Housing Alliance are slated to receive about $30,000 toward its goal of providing affordable housing in Southold Town, Mr. Beltz said. The money would go toward funding NFHA’s many services for lower-income families, including assistance with referrals, mortgage and foreclosures, housing rehabilitation projects, subsidized housing information, loan and grant applications, utility payments, and advocacy and counseling. Another $10,000 is allocated to Suffolk County Habitat for Humanity’s plan to transform a but a blighted property on Greenway East in Orient into Southold Town’s first Habitat home, he said. The money would be used to facilitate the demolition and reconstruction of the home. There is also $10,000 allocated to establish affordable housing on Fisher’s Island, Mr. Beltz said. Both CAST and Maureen’s Haven are expected to receive a piece from the block grant, Mr. Beltz said. A portion of the money for CAST would be used specifically to help fund the nonprofit’s new $30,000 Parent-Child Home Program. The national initiative launched on Long Island in 1965 focuses on children between 18 months and 2 years of age. Through the effort, CAST will send home-workers to the houses of participating families twice a week for two years, dropping off donated books and encouraging the parents to read to and play with their children. Homeless Outreach Program Maureen’s Haven was also allocated $5,000 for its efforts providing shelter, support and other services to homeless adults on the East End of Long Island during winter months. BARBARAELLEN KOCH PHOTO | Melissa Barrington, 31, of Riverhead broke down in tears as she told her story of becoming homeless to a reporter at the grand opening at the center last Thursday. Ms. Barrington is a client of Maureen’s Haven Homeless Outreach program, a Riverhead-based nonprofit organization that feeds, clothes and shelters homeless adults across the East End. She came to Maureen’s Haven when difficulties with transportation and toting around her possessions prevented her from finishing her college degree. Despite the warm weather this winter, she said, “it’s still too cold to sleep in the car,” so she’s opted to stay with Maureen’s Haven until she can get back on her feet. The organization, now celebrating its 10th year, has a brand-new day center on Lincoln Street that’s been a boon for those who, like Ms. Barrington, have nowhere to go during the day. She said she’s thankful for the food, the warmth of the building and, most important, the sense of community that Maureen’s Haven has offered her. The program, founded by East End nun Sister Maureen, who has since died, also has 15 host congregations on the East End. Clients are transported to and from these churches for evening meals, hot showers, fresh clothes and a place to sleep. Maureen’s Haven officials held a ribbon-cutting ceremony at the new day center last week. She said landlord Cynthia Fellows has been helpful to the organization, even putting “a partial kitchen in the back so our guests can prepare food or have coffee.” The new center is about a block away from Riverhead’s train station, Ms. Lutz said, making it more convenient for guests to access the buses that take them to and from host congregations in the morning and evenings. She said screening clients for alcohol, drugs or weapons has also become easier. Before the day center, screening was done at the railroad station. “With 40 or more homeless adults with all their bags and their stuff, it wasn’t really the most conducive way to do the screenings — and not very dignified. From a personal perspective, it was also very difficult for a staff person to screen people in the harsh weather, especially when people’s behavior might get a little more intense waiting to get screened after spending all day in the elements,” Ms. Lutz said. But Maureen’s Haven is not just about getting fed and staying warm in the winter, said Ms. Barrington, who was on hand at the ribbon-cutting to talk about the work the organization does for people like her. Among the programs offered at the new day center are Spanish and English computer skills, yoga, employment assistance, job coaching and even support groups, which have become important to Ms. Barrington. “It’s not structured like other groups, where you’re forced to talk about a specific subject. It’s more of a free-for-all,” she said, adding the group has fostered a sense of community among its participants. “They say three heads are bigger than one and I feel like if people pull together instead of pulling apart, it’ll be a lot better,” she said. As temperatures hovered near 20 degrees, dozens of brave souls dunked themselves into Peconic Bay in Mattituck Sunday morning to raise money for Maureen’s Haven Homeless Outreach. The organization is a branch of the Peconic Community Council and provides temporary housing, hot meals and personal items to people in need on the East End. Maureen’s Haven chairman Dwayne Wagner said he appreciated all of the support and predicted that this year’s plunge raised considerably more money than previous fundraisers. KATHARINE SCHROEDER PHOTO | Local residents participating in the Peconic Plunge fundraiser for Maureen's Haven on Sunday. COURTESY PHOTO | Elaine Villano, Maureen’s Haven coordinator (second from left), with (from left) Peconic Bay Zonta members Kay Jones, Barbara Pierce, Jackie Pottgen, and Diane Greenberg. Peconic Bay Zonta members teamed up with Maureen’s Haven Homeless Outreach Program by preparing a turkey dinner with all the trimmings for 40 homeless people this Thanksgiving. Maureen’s Haven volunteers served the dinner at Sacred Heart Roman Catholic Church in Cutchogue, one of 14 host houses of worship between Greenport and East Hampton. Affiliated with Zonta International, Peconic Bay Zonta members work to improve the status of women and girls through service and advocacy. For more information about the volunteer group, check out its blog.